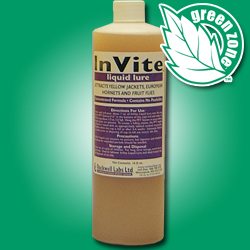 InViteTM Liquid Lure is an attractant that is versatile and economical and successfully kills a wide range of stinging insects and small flies. 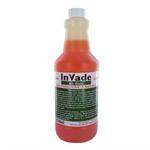 Just put 1-4 oz of InVite Liquid Lure in a hanging station or similar type trap. For stinging insects, you should dillute with water, fruit-flavored soda, or fruit juice to get the best results. For small flies, including red and dark-eyed fruit flies, phorid flies and drain flies, water, beer, or anything carbonated is ideal. The perfect killing station can be made for small flies by setting up a PFT Station along with InVite Liquid Lure. You should then wipe or lightly spray the station with some kind of micro-encapsulated residual or nonrepellant product. Flies that land on the station but dont get trapped inside will still get the residual on them causing death. Fruit flies are not typically attracted to insect light traps but can be brought to them by combining the bug light trap with about 2 oz of InVite Liquid in a condiment cup. Just set it inside or on top of the trap and leave it alone. Cotton balls can also be put inside the cup, if you like, effectively minimizing evaporation and spilling. Would you like to see the InVite Liquid Lure MSDS sheet? How about the InVite Liquid Lure Label?